3 Bed 2.5 Bath | 2,691 Sq. Ft. Welcome to the Hudson at Eaglehurst Homes! 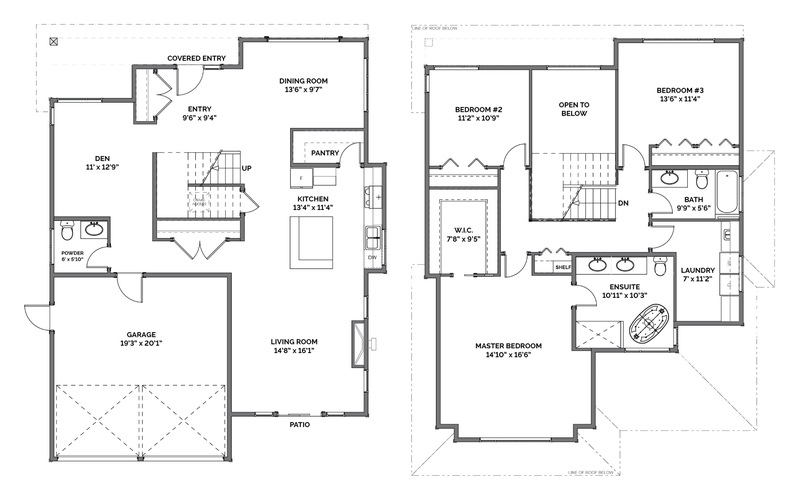 This brand new floor plan with 3 bed and 2.5 bath will be situated on our large laneway lots. This plan features a grand main floor entry and open stairwell with near 20′ ceilings followed by an open concept main floor living space with den/rec room for a home office or playroom. The custom gourmet kitchen is fully equipped with stainless steel appliances including natural gas range and vast amount of storage with separate pantry. Upstairs are 2 large bedrooms, a full bath and King-size master with a walk-in closet and beautiful ensuite complete with double vanity, radiant in-floor heating, tiled shower, and stand-alone tub. To top it all, this plan includes a double garage at the rear of the house to meet your storage/parking needs!